I have to share with you a clever project I saw at my sister in law Kris' house today! Her project started off with the round ends of a wire spool like this one. First she cut out the center of one circle along the ridge or groove (that attaches to the center of the spool) with a jigsaw. Then she randomly sliced off the outer ring of the spool end at angles with a chop saw to make the petals. 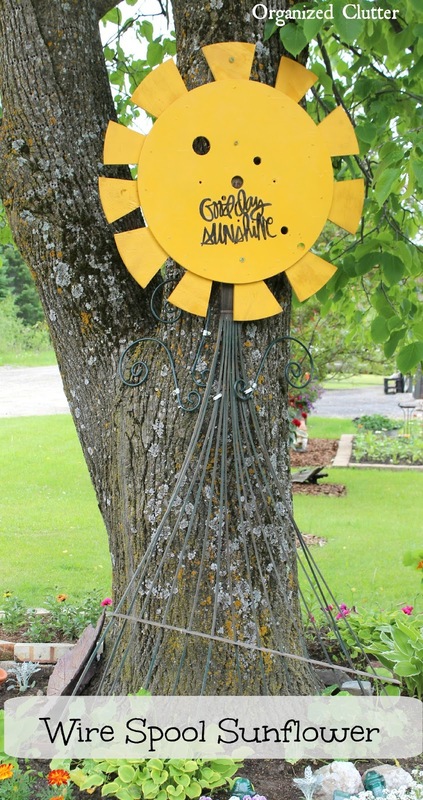 After attaching the petals to the outside of the spool end with screws, she painted the flower yellow, and added the "Good day sunshine" in script to the center bottom. Here is the bottom of her sunflower, an upside down trellis, and the leaves are curly green metal plant hooks. This is just a super fun project! She has climbing nasturiums planted at the base of the tree and is hoping that they climb the trellis. I love this idea! The creativity between your family never ceases to amaze me! Thanks for sharing. You two could write a book! Very cute!